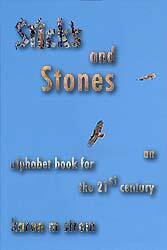 Sticks and Stones, an alphabet book for the 21st century , an ePub3 book for the iBook app in the iPad, has just been published by Polytropos Press. At the present time, due to the inclusion of scripting for the animation, sound and the image content, the book is available only for the iBook reader on the iPad and for the Chrome browser on your desktop with the Readium extension installed. The book may be examined, including a video of it "in action", on the book's website. There is now a Facebook page for the book. If you are on Facebook, we would appreciate your "likes." The Facebook page and the book website each contain a video where you may watch the book being "read." If you would like to download a sample of the book to play with it, please do. Please visit the website for the book to learn more about it, with the introduction, the video, a list of recommended reading and more.